We are delighted to welcome back Nick Lloyd of the Symphonic Brass of London and Ian Rowe of the Bromley Youth Music Trust for an evening of the “Best of British Brass”. 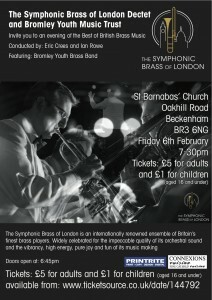 Highlights will include orchestral brass arrangements as well as classic brass band music. 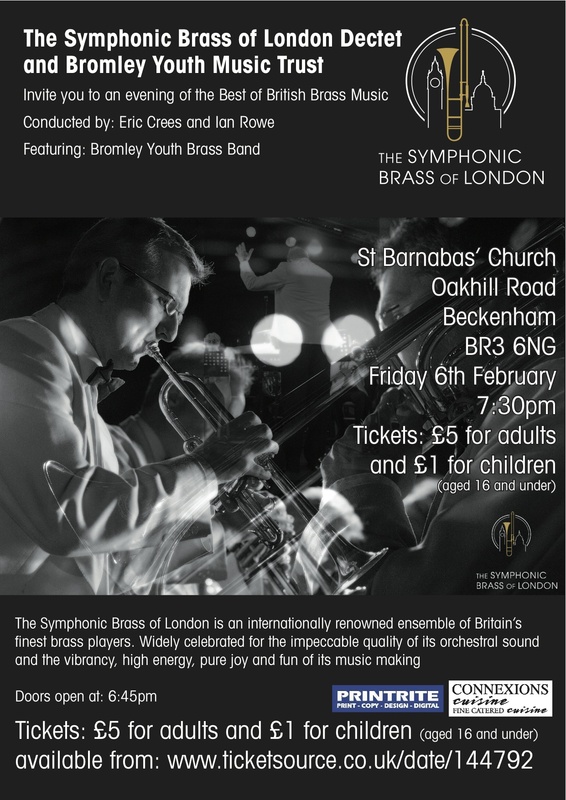 The Symphonic Brass of London, featuring players from London’s top orchestras in an outstanding professional brass ensemble, will play with Bromley Youth Brass Band, including the Brass & Percussion sections of the award-winning Bromley Youth Concert Band. This promises to be a spectacular concert as Nick and Ian’s teams join together to create a truly outstanding evening of music at St Barnabas and this event promises to be a sell-out. This concert is supported by local businesses and so the ticket price is just £5 for adults and £1 for children (aged 16 and under). Doors open at 7.10pm, with the concert starting at 7.30pm. Box Office: 020 8467 1566 or purchase here.